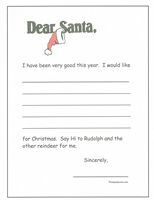 Free printable Santa letters are the easy way to find out a child's Christmas wishes. In the average daycare setting, the children are so excited about the upcoming holiday ... they talk about it for weeks. And what is the best way to let Santa know a child's wishes? Writing him a letter of course! So ... print off several copies of the letter and let the children get busy. Typically the children will be very excited about writing the letter. It's also interesting for the provider who will get to hear an assortment of wishes, some that are surprising. I was once told by a child that what he wanted more than anything was for it to snow on Christmas morning. He had moved to Minnesota from California a few months prior, and although he had the opportunity to see and play in the snow... he believed that Christmas morning snow was magical. He believed that if you made a wish while the snow was falling, your wish would absolutely come true! OR... children can be given crayons to draw small pictures of what they are hoping for. OR... save all the flyers and catalogs that arrive in the mail at this time of year. 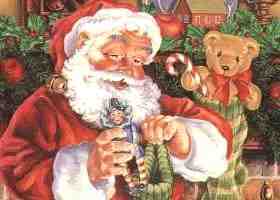 Let the children cut out pictures of what they would like to see Santa bring them, and paste the pictures to the letter. Wait ... there's more fun. Then … get some holiday themed printer paper and write letters to the children FROM Santa Claus. Make sure each child’s letter is written specifically to them, making each child’s letter unique. Don't promise anything specific in the letter in reference to gifts, ... simply elude to the fact that Santa knows the child has been good and will be stopping by on Christmas Eve.